Ida Leedam was born 1878 in Litherland, Lancashire, the daughter of Henry Leedam, a schoolmaster, and his wife Amy who also worked as a teacher. 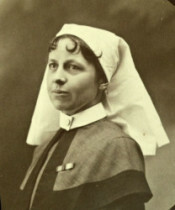 She trained as a nurse at the Royal Southern Hospital, Liverpool between 1904 and 1907 before working as a District Nurse in Nantwich. She joined Queen Alexandra’s Imperial Military Nursing Service Reserve in November 1914, and had a busy war, working in many places including No.1 General Hospital, Etretat, and also on hospital ships, ambulance trains and in post-war Germany. She was wounded in May 1918 as a result of enemy bombing while employed on No.24 Ambulance Train and was later awarded the Royal Red Cross (2nd Class). 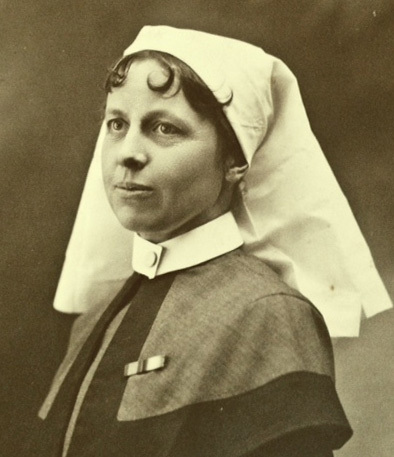 After the Great War she worked regularly in military hospitals as a member of QAIMNS permanent reserve, and also found time for employment as a District Nurse and as a nursing sister on board White Star Line ships. Ida Leedham died in December 1944.